Broda understands the challenges involved with bariatric care, for both care staff and patients. The Vanguard Elite is a revolutionary new seating option that helps address these challenges. Foot Pump Activated Seat Tilt Reduces lifting force required of caregivers, helping to reduce workplace injury. Broda Comfort Tension Seating®Aids in pressure redistribution, air flow, and long term sitting comfort, thus helping to reduce skin breakdown. 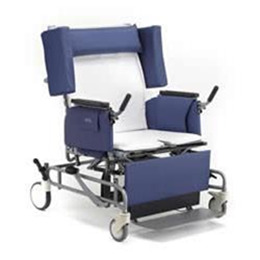 Concave (Curved) Back and Various Seating DimensionsOptional concave back accommodates patient’s gluteal shelf and various seating dimensions allow for proper fit, helping to increase patient comfort, support and dignity. Swing away, removable arms, removable wings, flip up footrest, and stand assist grips helps provide ease of transfers and accommodates various types of transfers. 6" front total lock casters and 8" rear multi directional casters provide easy maneuverability without lateral drifting. All wheel braking provides safety. The Vanguard Elite offers superior durability and stability- up to 600 lbs. Extensive testing has been performed on the Vanguard to ensure the weight capacity, stability, static strength and life cycle durability provide optimum safety and function in even the most extreme cases.